Join the discussion on our forums! Come discuss Pilfered Power over in our dedicated Pilfered Power discussion topic. Gain an empty Mana Crystal for each friendly minion. The Hozen don't get paid much, but at least they get to keep any excess mana. 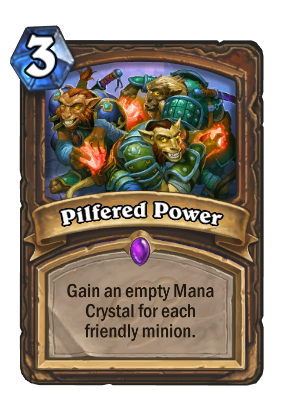 I gotta say the 10 mana combo of Living Mana (Spend 7)+ Pilfered Power (Gain 7 back immediately) is pretty crazy. Don't know it it is reproducible, but I encountered a rather odd bug during the current Tavern Brawl (Valeera's Bag of Burgled Spells), in that I could spend more than 10 mana after casting this spell. I had 3 minions already on the board, cast this, a new minion gets summoned (rules of the Tavern Brawl) and I get 4 new Mana Crystals. At some point I noticed that after spending all my 10 mana I still had leftover mana, even though graphically all 10 crystals were empty. So, after testing this card, it runs smoothly together with Living Roots: turn 2-4 an extra 2 mana boost on top of Wild Growth is a great leap forward for decks such as C'Thun Druid. Definitely not meta defining but rather playable at best. Is it me or has anyone seen this card in ladder? Cause all the druids i see are Malygos Druids or just Jade Idol Druids or a mix of both . Yet I've never seen a druid use this card before , i wonder why they don't use it. Is it too slow? or are the decks just not compatible? So far, I've never been happy to draw this card or see it in my opening hand. It seems like a win-more card because if I actually enough minions on board (2x) to get decent value out of this card by turn 3, it seems like I should be winning already. Seems like a 1-of at most. Surprised to see the Meta Defining vote, but never once saw it on ladder. Anyway, this card makes no sense. I had this card in my hand once as Rogue, after swash burgling it. I had no idea what to do with it. I play a lot of minions on board, gain crystals... ok. But what do I need excess mana crystals for if I extend my hand onto the board and am now mostly top decking? the only way to syngerize this to me would be to have a Cult Master in hand, to re-use all the minions for card draw and to then play a lot of stuff with your ill-gotten mana crystals. But that seems very situational to me. Turn 5, drop Living Roots x2 and this card and then next turn you are 10 - and you didn't lose your cards, your opponent had no counter play, and also put 4 minions on the board... Sounds OP to me. The real question is will it give card draw on turn 10 like Excess Mana? Location: Non of your business! On one hand this seems a bit broken, but Druids have so much ramp already that this just looks like a bit more gimicky Astral Communion. You either try to ramp so hard that you lose your entire hand in process (pretty much AC) or you use it later when you are at high enough mana, but then it's not that valueable IMO. Medium ramp value of this will be around 2 (noone will likely use this for 1, and you can combo with Living Roots or some 0-cost cards pretty easily), so it's still better than 2xWild Growth in that aspect. You forgot that you need minions in order to trigger the effect.